Story: Hultrasson is a Viking who is often assigned missions by his King Harald-les-beaux-cheveux. 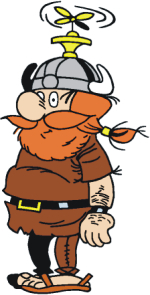 Background notes: The series about Hultrasson is usually perceived as a Viking version of Asterix, and on the surface level it is not a bad comparison. The missions and the fighting and dynamics of the storytelling have a lot in common with Asterix at the time. However, Asterix contains a lot of references to contemporary ideas and things happening in the real World, whereas Hultrasson is "only" the story as presented, making it less appealing to adults than Asterix. Like a lot of series, Hultrasson started out in Spirou and was collected in albums later. The first four stories were done by Marcel Remacle and Marcel Denis from 1964 (Fais moi peur Viking!) through 1967 (Les vikings aux champs). Of these, the last one from was only a 6 page short story. After this, the series took a break, until 1973, when Vittorio Leonardo and Maurice Tillieux made L'eau de politesse, the fourth album in the series. The story was very different from the originals, and it was the last album to be made. The last story to be published was a 5 page story called Hultrasson et la montagne aux oiseaux from Spirou #1973 from 1976 (by Vittorio Leonardo). Hultrasson was not Remacle's most popular or successful series, that would be Vieux Nick, but it did gain enough popularity to be published in other countries back in the 1970s (e.g. Denmark and Netherlands), and it is still remembered today 30+ years after the last story was published.